Now more than ever, organisations want the freedom of printing from a tablet or smartphone. 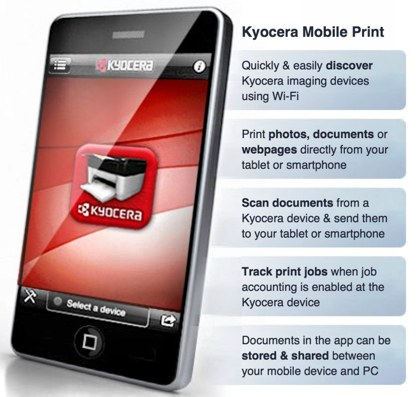 We combine the power of award-winning Kyocera imaging devices with our FREE Mobile Print* Application, using iOS and any Android compatible devices. – Automatically collect PDF documents from email and archive into the right folder. – Auto convert scanned docs into Word, Excel, or PowerPoint. – Auto convert scanned docs into searchable PDF/A docs, for easy archiving and retrieval. – Scan docs to cloud services, such as Dropbox, Evernote or google Docs. For these essential office automation solutions we offer locally based on site support. Looking for something more complex? No problem, let us know what you need and we will tailor the software solution for you! Fill in the enquiry form below and tell us what you are looking for.